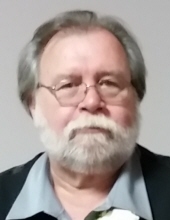 J Herbert Redman, 68, passed away Wednesday, April 10, 2019 at McLaren Bay Regional Hospital after a short illness. He was born October 17, 1950 in Flint, Michigan to J Herbert and Betty Jane (Tobias) Redman. Herb married the former Diane D. Dehmel November 11, 1972 in Flint. Herb and Diane moved to the Alger area 1 day after retiring, October 1, 2003. He enjoyed woodworking, deer hunting, ice fishing and playing cards. J Herbert is survived by his Wife, Diane and his 2 Sons; Jack (Jennifer) Redman and Brian (Kaitlyn) Redman. He is also survived by 4 Grandchildren; Kodi (Katelyn) Redman, Kylee Redman, Hunter Redman and Paige Redman and 2 Great Grandchildren; Cassidy Redman and Blake Redman. Herb is survived by his parents, J Herbert and Betty Jane Redman and 2 Sisters; Linda (Steve) Swire and Brenda (Ben) Pince and 2 Brothers; William (Pam) Redman and James Redman. He is also survived by many nieces and nephews. Herb was pre-deceased by 2 good friends, Pam Douglas and Dennis Hoover. Funeral Services will be Saturday, April 13, 2019 at 4:00 pm at the Lee Ramsay Funeral Home-STANDISH CHAPEL, Standish, Michigan. The family will greet family and friends from 1:00 om Saturday, April 13 at the Lee Ramsay Funeral Home-STANDISH CHAPEL till time of service at 4:00 pm. According to Herb’s wishes cremation will follow. In lieu of flowers the family has asked those considering an expression of sympathy to consider the Redman Grandchildren College Fund. To send flowers or a remembrance gift to the family of J Herbert Redman, please visit our Tribute Store. "Email Address" would like to share the life celebration of J Herbert Redman. Click on the "link" to go to share a favorite memory or leave a condolence message for the family.